Should Creepers Get Chased By Endermen Holding Ocelots? Poll: Do you like the idea? Poll: Do you support the idea? It is simply an Enderman holding an Ocelot. Enderman: When the Enderman spots a Creeper, it will start pursuing the Creeper. Ocelot: The Ocelot is immobile and cannot move. It makes Creepers run away. Also, Ocelots cannot be tamed when held by Endermen. Together, these two will start a Creeper chase (for fun). If the Ocelot was killed, it will stop chasing Creepers and revert to the usual Enderman behavior. If the Enderman was aggravated, it will drop the Ocelot and will stop fooling around. Just like a regular Enderman, this one can be aggravated by 'looking' at it or by hitting it. When aggravated, it will drop the Ocelot, stop chasing Creepers and start becoming serious. -Can only spawn in the Overworld. -Endermen have a 5% chance to spawn with an Ocelot in a Jungle biome, at layer 40 or above. -If not in a Jungle biome, there is only a 0.5% chance to spawn with one. -If lower than layer 40, there is a 0% chance to spawn with one. -Creepers should become passive running away from an Ocelot or an Enderman holding one. -Other Passive mobs should 'watch' Ocelot-wielding Endermen chase Creepers. -Creepers running away from Ocelots or Endermen holding Ocelots should create 'sweating' particles which can be turned off. -Allows access to Ocelots outside Jungles, but very rarely. No games do. But it would be fun to see them and a lot of them can make a game more interesting. 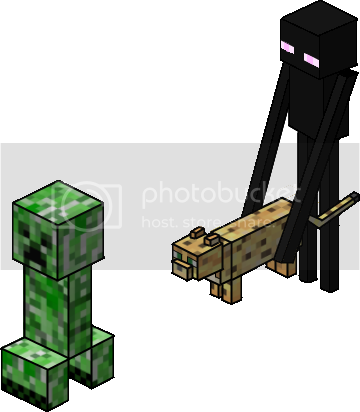 I can imagine an enderman holding an ocelot that is chasing a creeper... That'd be a sight to see... Cue chase montage! Sounds funny, and I guess I support, but I do have to ask: Why would the enderman be chasing the creeper just because it's holding an ocelot? I like this. It has potential for videos involving the Benny Hill theme. Watch me mine for crafts, craft mines, fall down shafts and do a bunch of other things that may or may not involve blocks. what would happen if you tamed /bread the ocelot? You are both rational and emotional. You value creation and discovery, and feel strongly about what I create. At best, you're innovative and intuitive. At worst, you're scattered and unpredictable. What Is Up With You And Endermen Holding Mobs? I'm (sorta) back, and with better grammar and more maturity. It says that when an enderman is holding an ocelot, it drops nothing. Why do you hate leather drops? Because endermen are jerks and trolls? I would love to see this, it would be hilarious, especially with brief "scream" sound effects from the Creeper. Support. What if, whenever a Creeper sees a cat, it will first jump back while doing the scream then start running away? There. Even more hilarious. Support! This would be funny. What Is Up With You Typing Like This? It hurts my eyes when you capitalize the fret letter of every word in a sentence. Please type like this. Don't Type Like This. Ahahaha if i saw this in minecraft i Luagh my head off XD. Support Full Support.